Have you ever felt like you were in the pit of despair? Like things couldn’t get any worse? Like the light at the end of the tunnel is really a train heading right for you? Elijah, in our first reading is in the wilderness, sitting in this pit of despair. He had been faithful to God when Israel was worshipping pagan gods. King Ahab was persuaded by his wife, Jezebel to abandon the worship of Yahweh and turn to her god, Baal, and her campaign was succeeding. They had destroyed the altar of the Lord and all the other prophets in Israel were in hiding, so Elijah was all alone. He organized a great showdown of which God, Baal or Yahweh, would send fire onto their sacrifices. Yahweh won, of course, sending fire that consumed an entire bull, all the wood it rested on, and the 12 jars of water Elijah poured over it to make it especially dramatic. There was no doubt who was the true God, almighty God! But Jezebel became so angry that she threatened to kill Elijah, sending him into hiding in the wilderness, where we find him under a solitary broom tree. He was alone and depressed and ready to die. Was there no reward for remaining faithful to God? Elijah was running for his life with no one to help him. He was in the pit of despair, believing that life couldn’t get any worse; the only light he could see at the end of the tunnel was the train of Jezebel heading in to kill him. Elijah felt like a failure—he had given up, losing faith that God was really watching out for him. That’s the problem with the pit of despair—we can be so lost and so despondent that we blame ourselves for being a failure while believing that God has abandoned us. We may have tried to do everything right—go to church, say our prayers, behave the way our Ephesians passage describes, being kind and tender-hearted, and forgiving. But then something happens out of our control—like a job lay-off, a major illness, the loss of a friend, the death of a family member—and it feels like God is a Jezebel who’s out to get us. It feels like our faith is slipping away. This was my experience when I was diagnosed with that Jezebel, breast cancer. It’s one thing to say I am a survivor—and believe me, I am so grateful! But it’s harder to admit that while I was in treatment it felt like I was losing my faith. • After 6 weeks of radiation I ended up with a severe frozen shoulder that required another surgery. The most difficult time for me came after my 2nd chemotherapy treatment in January 2008. I had only been at my new call at St. Mark’s in St. Louis for a year. The doctor said that some people receive a chemo treatment on Friday and are back to work on Monday. Well, I don’t know who these bionic people are, but I was not one of them. I was plastered to the bed and had to go on disability for nearly 9 months during treatment. My kids were still young—in 3rd, 5th, and 7th grades, and I couldn’t take care of them. Don’t you care, God? Does it mean nothing to you that I have served you, given blood, sweat and tears for your church, for your children? Can you ease the pain, the discomfort, the difficulty just a little bit for me? Can you not see the blood-thinning, weak, aching, lost misery of your servant? The psalmist cries, ‘in Sheol who can give you praise?’ (Psalm 6:5b.) Indeed, in chemo hell, who can give you praise? Not me. For here, you are silent; as quiet as the pillow to which my hairless head is stuck in numbing immobility. If this was the only thing going on in our life, it might have felt manageable. But our life was a catalog of calamity. In the previous 6 months, Dan’s uncle died, my favorite aunt died, and worst of all, Dan’s mom died of Alzheimer’s only 7 weeks before I was diagnosed. In the middle of my treatment, my father-in-law was diagnosed with stage 4 brain cancer. A week after his diagnosis, we received a $10,000 tax bill due a mistake our accountant made, and that was on top of the $10,000 in medical expenses we paid out of pocket with good insurance! I was so depleted and overwhelmed, I was afraid I was losing my faith. I found it hard to pray, I couldn't feel God with me like I have at so many other times in my life. Why do I share this with you in such detail? Because if you are in the pit of despair, have ever been in the pit of despair, or might some day find yourself in the pit of despair, I want you to know that I know, so you won’t be too afraid or ashamed to talk with me. Elijah and Jesus show us that when we are in the pit of despair, God comes to us as living bread! Two servings and Elijah is energized for 40 days! In my pit of despair, Jesus came to me as living bread through the kindness, generosity, tender-heartedness of others—like angels bringing warm cake and water. I couldn’t pray, but I knew other people were, so I relied on their prayers, and eventually mine came back. I couldn’t feel the presence of God, but I could see Jesus in all the people who helped us. Some days it was hard to believe that I would ever feel well again, but others believed it for me, and that was enough to see me through. In fact, God showed up a lot—more than I can recount. God showed up in angels of flesh and blood and love that I could hang onto. My parents made multiple trips to St. Louis from Texas to care for us, offering living bread. Two friends, who are both pastors and my two sisters took precious vacation time to help us, giving us living bread. Other friends brought lunch and scripture and prayers on numerous occasions—all of them, angels with warm cakes and fresh water. My Bishop came to visit me. I confessed to him I was afraid I had a weak faith, but he wasn’t concerned about that. It was a better day, and in his suit and dress shoes, he walked along the creek in the backyard with me—a gift of living bread. My husband, Dan wrote on a Caringbridge website to keep everyone updated and each night he read everyone’s prayers and words of encouragement—like angels flying in from around the country offering living bread. I received enough greeting cards to wallpaper two bathrooms—more living bread. Both of our congregations, our neighbors, and friends brought us meals—living bread for my family. Parents from our kids’ soccer, basketball, and baseball teams picked them up and dropped them off—living bread. My brother, Doug, sent me a Mother’s Day card—inside was a check for $7,000. I didn’t feel I could accept it, but he said, “I can’t take chemo for you, I can’t do radiation for you, but I can do this, so please let me.” Living bread. Dan—who was in pain himself over his mom's death, his dad's illness, and his fear of losing me—held our family together with the help of all these gifts of living bread. St. Mark’s made a quilt for me with each family making a square, and they wrapped me in love. 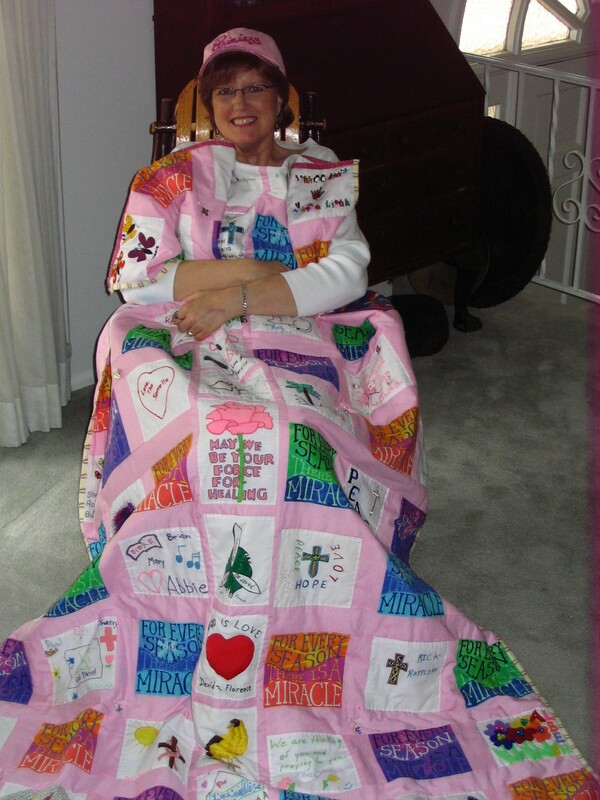 Other’s made prayer shawls—angels offering comfort and hope. Elijah’s problem was not that he was alone, but that he THOUGHT he was alone. Once he ate the angelic cakes, God sent him to appoint a new king as well as Elisha who became his disciple. We can have too individualistic an understanding of our faith experience. 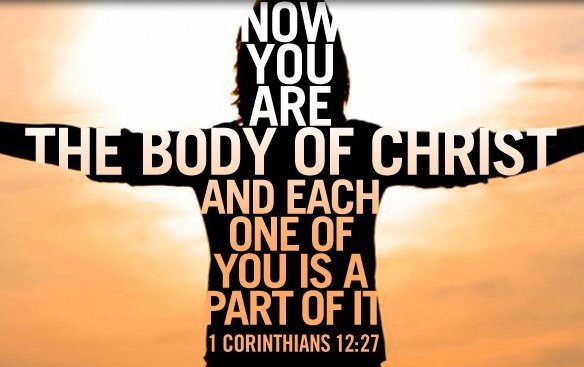 Together, we mediate, embody, and make known Jesus, the living bread come down from heaven, for each other. We have faith because we are in community—the community believes with us and even for us when we’re in the pit because we are Christ’s living bread together. It turns out that during treatment, I had the strongest faith I’ve ever had, because it was faith not of my own narrow experience, but the Living Bread of Jesus in the faith of others who carried me. Some of us are in a time of despair—and need to receive the gifts of love and support from others to get through a current crisis. If that’s you, please be honest about your pain, and willing to receive help from the angels around you who can be the living bread of Jesus for you. Let me know what would help you so we can be faith for you. Others of us are in a season of giving, able to be the living bread Jesus uses to bring food, love, hope and comfort to those who are in the pit. If that’s you, please notice and ask what would help those in a crisis. 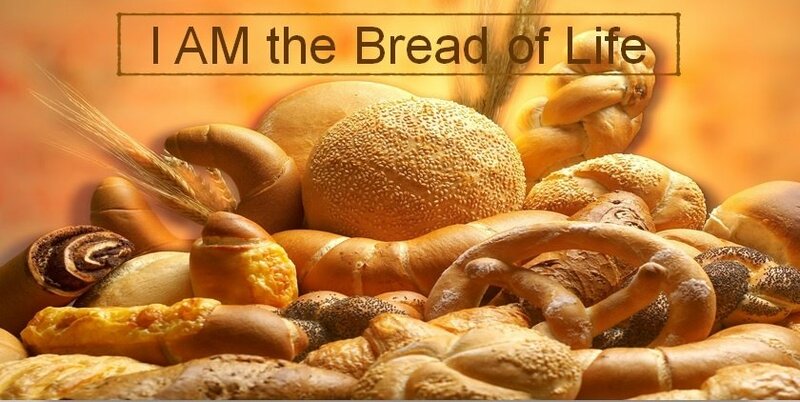 Look around you, St. Luke’s, taste and see the living bread of Jesus Christ!